The Duke of Marlborough. Oil by Adriaen van der Werff. 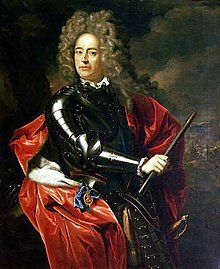 John Churchill, 1st Duke of Marlborough (26 May 1650 – 16 June 1722) was an important English soldier and statesman. He lived through the rules of five monarchs through the late 17th and early 18th centuries. Rising from a lowly page at the court of the House of Stuart, he faithfully served the Duke of York through the 1670s and early 1680s. This gave him military and political advancement through his brave, clever skill. Churchill helped secure James on the throne. However, just three years later he left his Catholic teacher for the Protestant Dutchman, William of Orange. He was honored for his services at William's coronation with the earldom of Marlborough (pronounced /'mɔ:l bəɹə/). He served in the early years of the Nine Years' War and became famous. However, charges of Jacobitism made him fall from office. For some time, he was imprisoned in the Tower. When Queen Anne came to throne in 1702, however, Marlborough secured his fame and lots of money. His marriage to the quick-tempered Sarah Jennings – Anne's close friend – helped Marlborough's rise. He first became the Captain-Generalcy of British forces. Then he became a duke. Later, he became the richest of all Anne's subjects. Although in the end he could not completely crush his enemies, his victories allowed Britain to rise to very great power. Through him, the country grew more and more rich through the 18th century. 26 May 1650 - 21 December 1682: John Churchill, Esq.